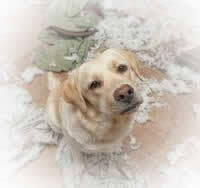 Separation anxiety in animals is an exaggerated fear an animal can develop when their people leave the scene. Social creatures need relationship. If they think that relationship is threatened, it triggers stress behaviors in the animal. Separation anxiety is seen mostly in dogs, but also parrots, mice and cats can suffer. Any animal that develops social bonds can develop separation anxiety. This information will be centered on separation anxiety in dogs.The higher the sociality of the animal, the greater the risk of separation anxiety, this is why dogs are one of the most common sufferers of separation anxiety. The stress behaviors related to separation anxiety for dogs include digging, scratching at doors or windows and other potential gateways to open what the dog sees as the blockage between them and their person or people. It can include destructive chewing, howling, barking, whining, crying and unusual urination and defecation behaviors in an otherwise house-trained animal. Some common things that can trigger separation anxiety are when a dog is used to constant companionship and is then left alone. They have no coping skills, so it triggers a panic. Time at a shelter or boarding kennel is a potential trigger unless properly prepared for. Dogs need social contact as sure as they need to eat and drink. Many shelters rely on teams of volunteers to walk the dogs regularly and keep them in close contact and stimulated for this very reason. It makes them more social and adoptable. Dogs are a bit on the obsessive compulsive side anyway. They thrive on routine. Sniffing the same spots (reading the pee-mail) and walking the same haunts with a bit of adventurous flare when confident is the bread and butter of a happy dog life. Any break in routines such as kids going back to school, the loss of a family member, or another pet can trigger separation anxiety and the accompanying stress behaviors. Minor separation anxiety can be addressed by not making a big deal out of any arrivals and departures from the house. Although it sounds counter intuitive, ignore the dog(s) for the first few minutes when you arrive, then calmly greet them. Make a behavioral statement that it is no big deal. The same goes for leaving. Do not make a spectacle with jingling keys, rituals of putting coats, and so on. Just a quick and quiet exit. Arm them with puzzle toys and things that smell like you. You also want to get a dog trained to a cue that assures them of your return. “A safety cue” such as a word or action that you use when you leave that they learn to connect with the fact that you will be back.A radio or other noises can be used as safety cues, or a word or specific behavior. Just make it something specific and consistent. Dogs make connections, so use that to your advantage. Training in this area may have to begin in 30 second intervals where you use the word or deed. First , use the safety cue, then exit, then come back in. (Making sure you do not pay too much attention to them when arriving back in. Build up the time interval over time. This will establish the connection for the dog. They will begin to connect that word or behavior with the notion that you will be back and the panic can subside. A well run and stimulated dog is important too. They are much calmer. Dogs are roamers. Walking and sniffing as well as running and chasing with an interval before leaving goes a long way toward reducing separation anxiety. You may also want to consult your veterinarian or pet professional about calming products that can act as a bridge as you establish the notion that you will return in a language the dog(s) understands. Some of these products available are over the counter and some are prescribed by a vet. . In severe cases desensitization training may be in order. This begins first with teaching the sit and stay commands and building from there. Teaching sit and stay commands and associating them with positive reinforcement gives you a foundation to begin addressing separation anxiety. This is followed by using that command while you move further and further away, such as another room. It is also important to leave them in a “safe place”. 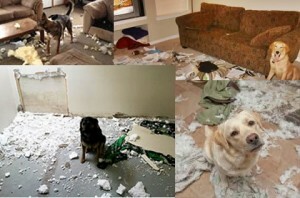 The “safe place” should limit the dog’s ability to be destructive at the same time it should be stimulating. An area like a room with some toys and other distractions to keep the dog busy. Dirty laundry and other smelly things is a big plus. Dogs want a reminder of you and smell is their main means of communicating and staying connected. These kinds of comfort cues will contribute to passing along coping skills. Continuing praise and reward when the dog “gets it” and increasing the duration over time is part of desensitizing them to separation. This builds a connection between remaining calm and happy in one place while you go to another place. Again increasing the duration over time is key to reducing the stress. Early training can go a long way toward avoiding separation anxiety. Socialization is a broad term used to describe exposing your dog to the things they will encounter in life, one of those is separation. Training early is best because puppies are setting up their “puppy wiring” that will set the stage for how they cope for the rest of their life. If you got your dog later in life and do not have the time or patience to go through the desensitization process, you may consider these alternatives: Doggie day care, or leaving the dog with friends or family that are home during your away time can bypass the separation anxiety. It can also be fun and rewarding if you can arrange to take the dog with you when you go, even to work, if that’s possible. One last thing: It’s important to understand that stress behaviors are not punishment or hostility toward you from the dog. Punishing them is not only ineffective, it is counter productive. In addition to the stress of you leaving they will now have it when you get home as well. It is also ineffective to get another pet to solve the problem since dogs pick up cues from each other on how to behave. Patient consistent training over time is the most effective means of reducing and eliminating separation anxiety other than keeping them stimulated and socialized constantly.